Honestly this was the most powerful movies I've seen in a long long time, it was really compelling to watch! I cried several times during the film. It has topped the box office for three weekends in a row! If you see one movie this year this should be it! It's inspired by real-life butler Eugene Allen who worked in the White House under eight Presidents. 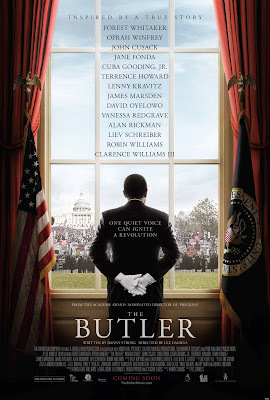 It has an all star cast of Oprah Winfrey, Forest Whitaker, David Oyelowo, Cuba Gooding Jr., Mariah Carey, Terrence Howard, Robin Williams, Jane Fonda, and Lenny Kravitz. The cast was amazing, Oprah and and Forest did an amazing acting job! Wouldn't surprise me if Forest got an Oscar nomination for it. I thought Mariah was miscast as a light skinned field slave. After seeing the movie I saw Lenny Kravitz's name in the credits and had to go back to figure out who he was because I didn't recognize him clean shaved with cut hair. lol Terrence Howard is missing a tooth in the movie, turns out it wasn't a special effect, he really did remove a crown for the movie! Robin Williams played President Dwight Eisenhower, it was interesting to see him in a serious role. The movie gave a great refresher on the civil rights movement, perfect timing with the 50th anniversary of the March on Washington. I truly think you will be wowed by the movie as it gives a much better perspective on the movement than any history book will. corresponded over the part for accuracy. On a positive note Eugene Allen was given a VIP invitation to Obama's swearing in ceremony. You can read more about him here. 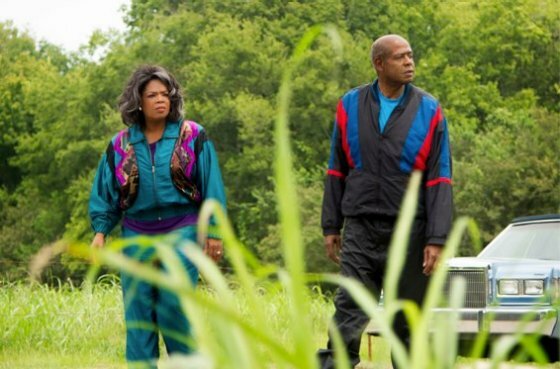 The funniest moment in the movie was seeing Oprah Winfrey in an 80s tracksuit! lol The rest of her fashions all through the movie were very glamorous! Did you have a tracksuit? I didn't.